However, mother nature had a different plan in mind. It started raining and never stopped (in fact, 5 days later, it is still raining). Luckily for us, the magical powers of the Pink Palace turned what could have been a dreary day into an amazing day. Obviously, we skipped our much anticipated beach day and did the next best thing - go shopping at the nearby Ellenton Premium Outlets. If you find yourself staying in St Pete Beach, it's only a 20 minute drive to the Outlets, where you will find Saks, Kate Spade and even my friend ASICS. After some great purchases, we headed to lunch at Sea Porch. I have had the opportunity to dine here a few times and am familiar with the menu. However, Sea Porch has a new addition - Chef Patrick Gossett, who we had the opportunity to meet. It came with high suggestion to try the Goat Cheese Fritters from the Small Bites menu. They were so good we ordered a second round. I mean, deep fried goat cheese? Topped with Acai Poached Pear Salsa, toasted pecans and wildflower honey, how can one possibly go wrong. 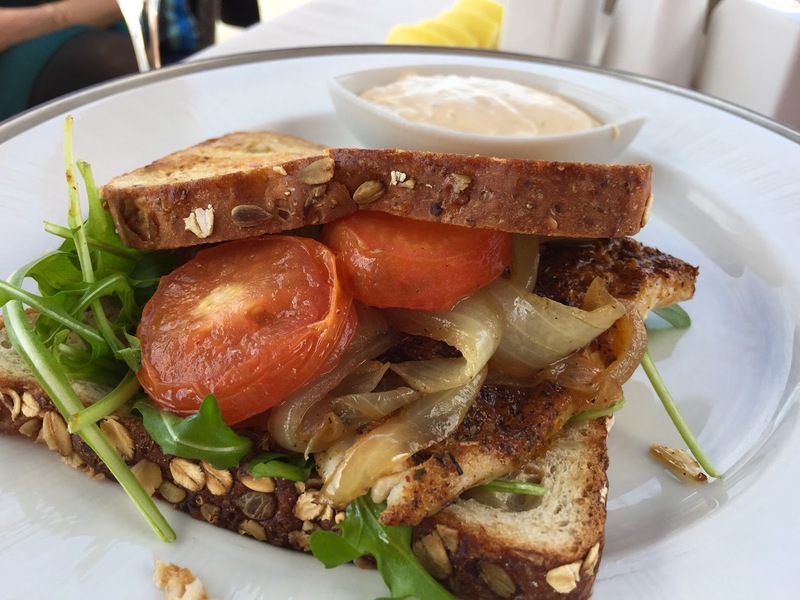 I was super torn for what to order - I had the Blackened Grouper Sandwich on my last trip to Sea Porch and it was delicious. However, I wanted to try something else and went for the Low Country Shrimp & Grits. I am a Grits snob.....my Mom's family is from South Carolina and Grits were a staple on Sunday morning breakfast. Sea Porch's grits are Megan approved. They were super creamy with white cheddar and simply delicious. The shrimp were gulf pinks, one of my favorites, topped with a Tasso and roasted tomato sauce. One the side were Crispy collared greens. I would order this again in a heart beat. If I had to choose between the Blackened Grouper Sandwich and the Shrimp and Grits.....the Sandwich would win by 1% - I mean, look at this thing. Plus, Grouper sandwiches are in my top 5 favorite foods. Keri ordered the Gulf Fish Taco's, which had blackened mahi mahi, a nice cabbage radish slaw and cilantro crema. They were amazing. While I love fish tacos, I am always worried about them being fishy. Not at Sea Porch. I would absolutely suggest ordering these if you like Fish Tacos. Following lunch at Sea Porch, we headed to Spa Oceana for Treatments which I will discuss in a future post. In the meantime, I wanted to leave you with the beautiful Sunsets you can experience while dining at Sea Porch. 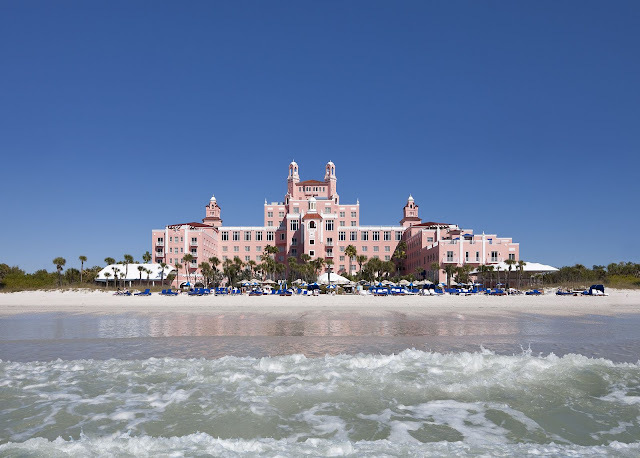 Through September 7th, Loews Don CeSar has an amazing special where visitors can experience St. Pete Beach like a local. Few people know St. Pete Beach better than Loews. And, no one can deliver a vacation getaway that is as uniquely local other than the team at the Pink Palace. Guests can enjoy accommodations inspired by the waters of the Gulf, breakfast daily and a choice of either a Dolphin Watch cruise nearby) or a Sunset Sail. 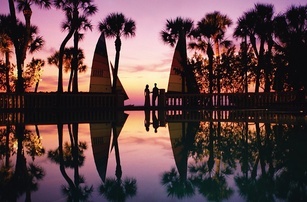 There is no better way to experience the natural wonders of St. Pete Beach, its world famous sunsets or witness first hand playful dolphins frolicking in their own backyard.